Is the existence of “Garrett guys” really such a bad thing? Every year as we draw nearer to the NFL season starting, much is made about who the captains on the Dallas Cowboys will or won’t be. In years past people have petitioned for Byron Jones to get the call. Some thought that Orlando Scandrick was deserving (he was finally made a captain in 2017). Every year there is a crowd of folks championing Dez Bryant to finally get the nod. This shouldn’t be a big deal in an A.D. Cowboys world (After Dez). Dez Bryant is gone. He’s been released. He’ll have a new team soon. So what about who’s a captain? The issue of captaincy was brought up by Dez himself during his exclusive interview with NFL Network’s Jane Slater on Friday evening. Bryant brought up the people that wear the captains patches for the Cowboys, insinuating that they are the “Garrett guys” who helped lead to his demise in Dallas. Looking past Dez’s “they don’t know we know they know we know” Monica Geller moment, you can see (no pun intended) where Dez drops the C. As you can imagine, there’s been quite a fallout. Let’s be clear. 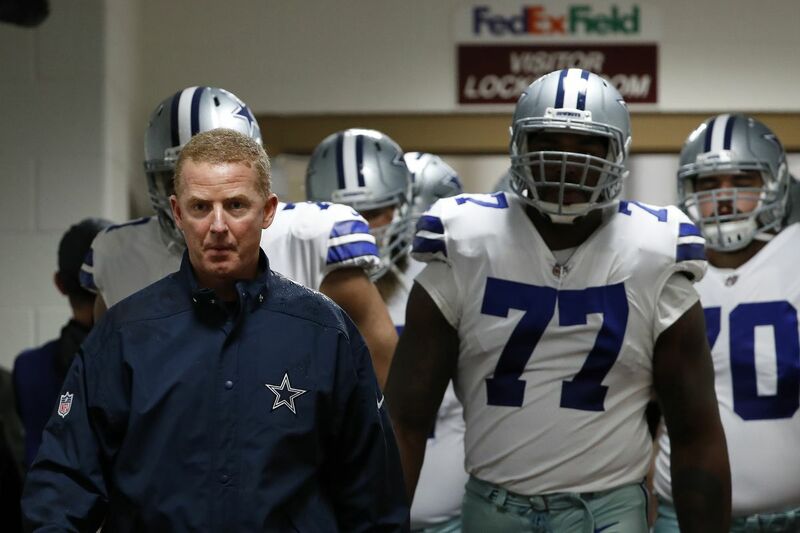 You can make an argument that Jason Garrett should have been relieved of his duties as the head coach of the Cowboys after 2017, but the reality is that he wasn’t. Garrett is the man charged with leading America’s Team for the eighth consecutive (full) season. If there are “Garrett guys”, players that seemingly wear captains patches (Dak Prescott, Jason Witten, Sean Lee, Tyrone Crawford, and Dan Bailey remain from 2017), is that not… a good thing? Dak, Witten, Lee, Crawford, and Bailey aren’t the brain trust that has appointed Jason Garrett as their leader. In the world that they operate, he is their head coach. They are captains. They have a responsibility as those captains, and more importantly as leaders of the team, to uphold the message and disposition coming from above, do they not? If your answer is no to these questions, then what would you prefer? Would a better world be one where the most important players on the Dallas Cowboys all outwardly defy their head coach? Would a locker room consisting of 100% opposition be a more ideal situation? I’m not trying to advocate on Jason Garrett’s behalf here, but there really shouldn’t be any chastising of his so-called “guys.” These are players who are simply doing what the NFL cliche asks them to do all the time, their jobs. Remember here, it is the team that votes for captains, they are not appointed by Jason Garrett. This isn’t a situation where Garrett hand-picked the players he wanted to be his guys because they rode along with his message. It is a democratic process that leads to the selections. If the theorized “Garrett guys” are indeed the ones who wear the captains patches, do they not theoretically speak on behalf of the whole team as well? It’s understandable that Dez Bryant would feel one way about all of this, but to isolate the blame to the leaders of the team (who are voted upon) doesn’t seem logical. You can be upset that Jason Garrett is the head coach of the Dallas Cowboys, no one’s going to stop you there. It doesn’t make sense to be miffed about his “guys” advocating whatever his message is. You should be proud of them for doing so.